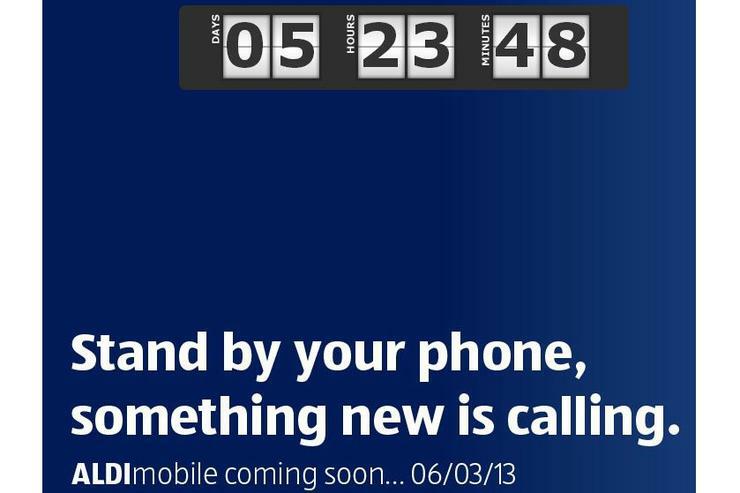 The Aldi Mobile website currently includes a countdown timer to next Wednesday 6 March at 8.30am. Pricing for German supermarket chain Aldi's new pre-paid mobile network, Aldi Mobile, has been revealed. 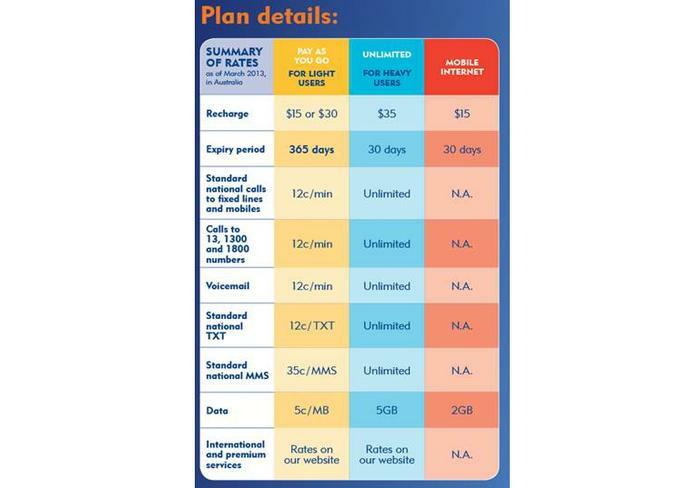 Australian blog EFTM has published Aldi Mobile's full pricing structure and also confirmed that the new mobile virtual network operator (MVNO) will use the Telstra wholesale network to provide its service. Aldi Mobile will offer two pay as you go plans, $15 and $30, along with a $35 unlimited plan that includes 5GB of data. The company will also offer a $15, 2GB data-only plan with a 30-day expiry for tablet devices. Aldi's $15 and $30 pay as you go plans both have a 365 day expiry. Standard national calls, mobile calls, calls to 13, 1300 and 1800 numbers and voicemail are all charged at the flat rate 12 cents per minute. SMS messages are charged at 12 cents each, MMS messages at 35 cents each and data is billed at 5 cents per megabyte (MB) on both plans. The $35 a month Aldi Mobile plan has a 30 day expiry and includes unlimited calls, voicemail, SMS, MMS and 5GB of data. The plan is $6 more expensive per month than Kogan Mobile's unlimited plan, which includes 6GB of data and remains the cheapest on the market. The pricing structure of Aldi Mobile. Like Kogan Mobile, EFTM reports Aldi Mobile will use the Telstra wholesale network to provide its service. The Telstra wholesale network is capped below the regular data speeds of Next G and covers 97 per cent of the Australian population. It offers typical download speeds of between 550 kilobits per second (Kbps) and 3 megabits per second (Mbps). The launch of Aldi Mobile was first reported earlier this week by Android blog Ausdroid. The service will launch next Wednesday 6 March and the Aldi Mobile website currently displays a countdown timer that ends on that date at 8.30am. Most Aldi supermarket stores across Australia open at this time on weekdays. Along with the Aldi Mobile service, Aldi supermarkets will begin selling mobile phones from next week. 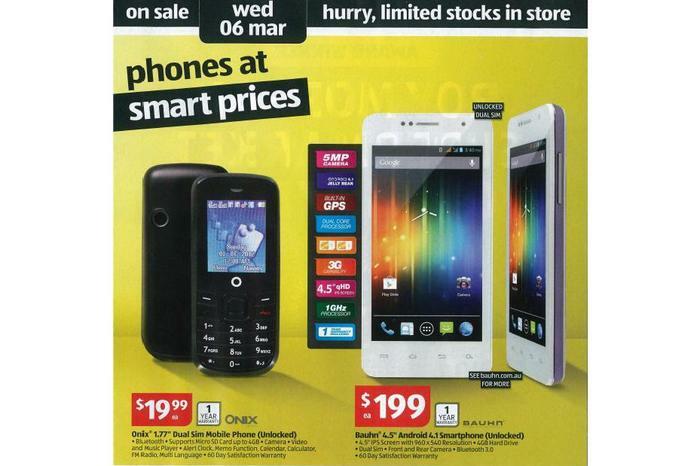 It's latest catalogue advertises a dual-SIM, Onix branded feature phone for $19.99 along with a Bauhn-branded Android phone, also with dual-SIM capabilities, for $199. The Bauhn ASP-4500Z Android phone is advertised as having a 4.5in IPS screen with a qHD resolution of 540x920, a 1GHz dual-core Cortex A9 processor, 512MB of RAM and 4GB of internal memory. It also includes a microSD card slot, a 5-megapixel camera and a 2000mAh battery and runs the 4.1 Jelly Bean version of Google's Android operating system. Are you impressed with Aldi Mobile's pre-paid rates? Would you use the service? Let us know your thoughts in the comments below! • Aldi to launch Aldi Mobile pre-paid service? • How fast is the Kogan Mobile network?